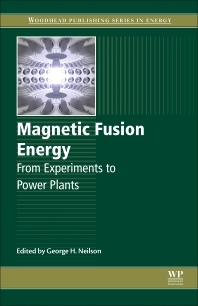 Magnetic Fusion Energy: From Experiments to Power Plants is a timely exploration of the field, giving readers an understanding of the experiments that brought us to the threshold of the ITER era, as well as the physics and technology research needed to take us beyond ITER to commercial fusion power plants. With the start of ITER construction, the world’s magnetic fusion energy (MFE) enterprise has begun a new era. The ITER scientific and technical (S&T) basis is the result of research on many fusion plasma physics experiments over a period of decades. Besides ITER, the scope of fusion research must be broadened to create the S&T basis for practical fusion power plants, systems that will continuously convert the energy released from a burning plasma to usable electricity, operating for years with only occasional interruptions for scheduled maintenance. Professional scientists and engineers involved in fusion energy experiments as well as postgraduate researchers in academia working on nuclear fusion. Dr George "Hutch" Neilson manages PPPL’s international stellarator and tokamak collaborations. In that context, he is program manager and national point-of-contact for U.S. collaborations with the Wendelstein 7-X stellarator experiment in Germany, and a project manager for coil-design collaborations with the JET tokamak experiment in Oxfordshire, UK. Neilson is also the responsible manager for PPPL advanced design activities, and for planning for a next-generation experimental fusion facility, or DEMO, that is to precede a commercial fusion reactor.